At SoOrganic we're lucky to be exposed to whole heap of likeminded eco minded, organic loving people. Last week I came across Master Composter Sarah Blenkinsop. Sarah writes a blog devoted to garden care and is currently writing a book on a subject she is so passionate to talk about. Sarah promotes composting in Herefordshire, on behalf of the Council and Garden Organic and has recently been helping the local school kids build a most excellent (as the pics on her website suggest) organic vegetable garden created using her very own fresh compost. Composting is the process organic materials are recycled back into soil by way of accelerated decomposing. It is an essential part of soil fertility. As far as I can gather (and I'm no expert - my compost bin is in need of a make over) composting requires a few good tips and dash of know-how. •	Use a 50:50 mix of green and brown materials. Green materials include such things as fruit and veggie scraps, dead flowers, coffee grains and grass cuttings. Brown materials include tissues, toilet rolls, wood chippings, egg boxes and shells. •	If you're after the eggshellless look in your garden use a sieve to remove any large particles before using on your veggie patch or flower bed. 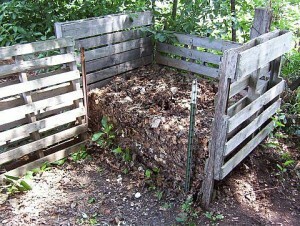 If you have any questions about how to make compost or what to do with it visit Sarah's blog compostbins.blogspot.com. She's ‘always happy to talk compost'. The queen of organic compost has got me and my backyard interested in the wormier ways of garden life. How bout you?